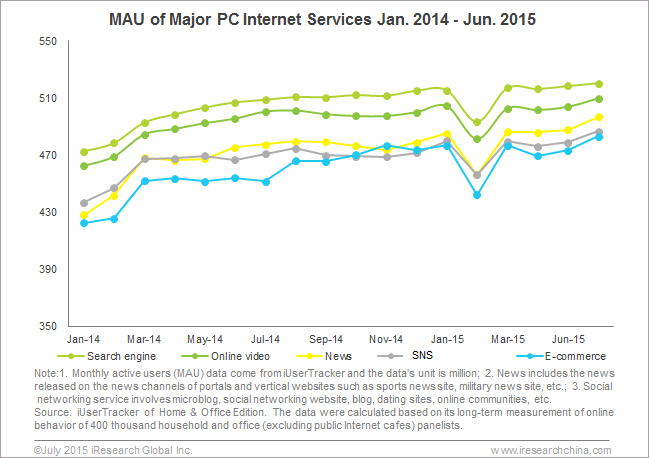 On PC, online video was next only to search engine in MAU which was 520.10 million for search engine and 509.46 million for online video in June 2015. 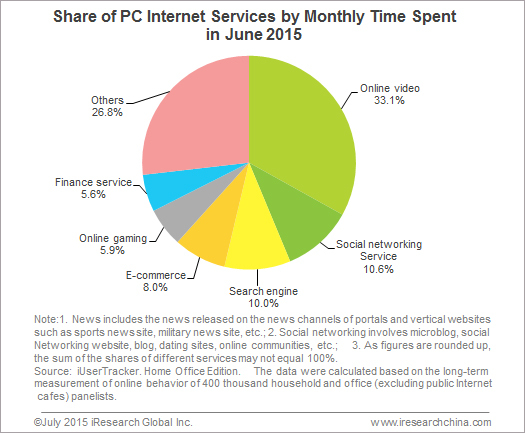 They are the top2 PC Internet services by MAU in China. iResearch believes that with fairly large user base and being relatively saturated, PC online video market is currently a stock market. Online video ranked first by monthly time spent. 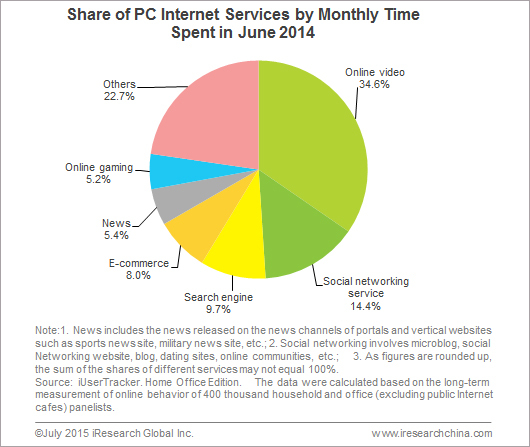 Online video took up 33.1% of the time spent of all PC Internet services in June 2015, a little lower than the 34.6% in June 2014, but it was still the No.1 Internet service by monthly time spent. iResearch analyzes that thanks to the various and large amount of video content, online video has become the most important entertainment of China Internet users. 1.People’s adoption of multiple devices brings new opportunities. Wider growth space for online video companies. The four devices (PC, smartphone, table and TV) enable Internet users to view video in a long period of time or with fragmented time which is favorable to attracting more users and getting more traffic. More complete user profile for online video companies. 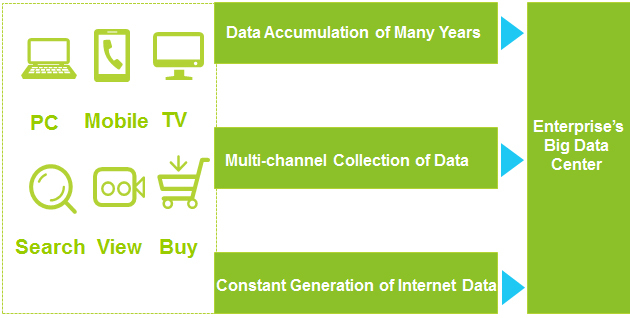 The four devices are used by online video audiences in different scenarios. Through analyzing their account, network environment or by other means, it is possible to reveal audiences’ usage behavior of different devices and advertisers are then able to place ads precisely according to audiences’ profile and the different usage scenarios of different devices. More complicated industry chain. Due to the mutual penetration and integration of online video companies and offline content production agencies, the industry chain is becoming increasingly complicated which creates lots of opportunities for involved parts. Data about users’ activity degree, including the days and time when they are active, etc. Above data can be classified into user data, content data and behavior data. With accumulation of many years and cooperation with other data providers, online video sites usually hold massive valuable data, so mining of these data will greatly enhance the precision of advertising. Since the high return of precision advertising is based on abundant traffic, large user base is vital for precision advertising to realize its value.